The 1849 Liberty Double Eagle is one of the most famous and valuable coins ever struck. Only a single example of this legendary rarity is known, although for more than a century there have been rumors of an additional specimen. The known coin is part of the National Numismatic Collection of the Smithsonian Institution and thus very unlikely to ever become available to collectors. Its estimated value is around 15 million dollars, although the price at auction could be substantially higher, thanks to the important status of this famous issue. The history of the coin starts in January 1848, when gold was discovered in the Sacramento River, located in the United States territory of California. Having only recently become part of the United States, California was sparsely settled at this time, although small groups of settlers came in every year via the Oregon Trail. This would all change after the first flakes of gold were discovered and the news reached the states along the eastern seaboard. A massive movement of people and supplies began, all headed west towards California. Thanks to the discovery of gold in California both the United States as well as its monetary system would never be the same again. In 1848 the largest denomination was the eagle, or the ten dollar gold coin, as specified by the Mint Act of 1792. First struck in 1795, it was a large and valuable gold coin, used mainly in business between banks and in overseas trade. If the huge amounts of gold were never discovered in California, or had the territory still been part of Mexico (as it was only a year earlier), history might have been completely different and the United States would have never needed a coin of the twenty dollar denomination. However, because there was such a huge amount of gold coming into the Philadelphia Mint for coinage, a larger and more suitable denomination was deemed necessary. This would become the Double Eagle, or $20 gold coin. Technically, the 1849 Double Eagle is a pattern, an experimental piece struck before issuance of a new design, or in this case of a new denomination. The design was made by James Barton Longacre, and eventually the Liberty Double Eagles would be minted in a somewhat modified form until the early 20th century. It all started, however, with the 1849 pattern. The coin is listed in all pattern references, as Judd-117 and Pollock-132, with both texts referring to it as a unique coin. This, however, does not necessarily have to be the case, as some researchers have contested. Walter Breen mentioned that not one but two pieces were struck on December 22, 1849 and supposedly the second piece was photographed for the catalog of the Steven K. Nagy collection, per Akers. This, however, remains unconfirmed and seems incorrect. Nagy passed away in 1958 and except for some unconfirmed rumors nobody seems to have known anything about a second 1849 Double Eagle. It might exist, although the chance is very small, and it seems extremely unlikely that after more than 100 years it would suddenly turn up. Strange things, however, have happened in numismatics before so the possibility is always there. Interestingly enough, we also know that a striking in Brass was made at a later date, supposedly in the 1870s, which sold for $55 in an 1892 auction. The coin appeared to be gold plated (gilt) when it was photographed for that sale, and has not been seen since. The piece was supposedly traded by the Mint for an 1804 silver dollar sometime in the second half of the 19th century. If that coin is ever found, it would without doubt be a major numismatic discovery, and an extremely valuable item as well. This Brass piece is listed as Judd-118 and Pollock-133 and thus is only known by the aforementioned photograph. There are a few minor differences between the 1849 Double Eagle in the Smithsonian Institution and the 1850 Double Eagles struck for circulation the following year at the Philadelphia Mint. Most importantly, the coin is in a slightly higher relief than any of the circulation strikes from later in the series. The placement of the stars is also slightly different as is the execution of some very small details of the design. Other than that the pattern piece is similar to later issues of the earliest Double Eagle type. With only a single example of the 1849 Double Eagle known to exist and that coin not available to the public market, a discussion of the finest known and values seems unnecessary at first glance. However, the coin does deserve a discussion of its condition and possible value. Neither of the major grading companies have ever had a chance to grade the unique 1849 Liberty Double Eagle, although the coin is usually encapsulated in a holder which NGC specifically made for the Smithsonian Institution. PCGS has mentioned that they graded the coin to be around PR-63 or PR-64, based on grading it through glass when it was part of a traveling exhibit. Interestingly enough, it is obvious from both pictures as well as in public viewing that the coin has been harshly cleaned, a practice which was common at museums (including the Smithsonian Institution) in earlier times. For a coin such as this, however, the grade holds less importance since there are no other examples known to exist. The approximate value of the 1849 Double Eagle difficult to assess. Besides the aforementioned estimated value of fifteen million dollars, other estimates have ranged from ten to twenty million dollars, if the coin were to ever be sold publicly, which is virtually impossible. There is one value from more than a century ago that is interesting to note. 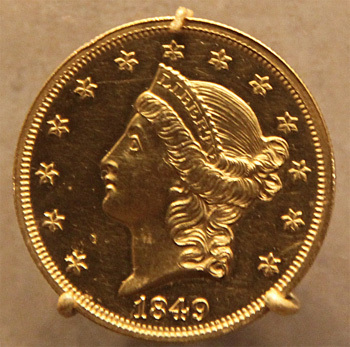 While the Mint has received numerous offers for the coin, one has been highlighted in many descriptions of the 1849 Liberty Double Eagle. In 1904 $35,000 was offered to the Mint who still had the coin in its possession at the time, it was only later transferred together with the other items from the Mint’s collection to the Smithsonian Institution. At the time of the offer, this represented an immense amount. Other important coins, including 1804 silver dollars, rarely sold for more than $1,000 at that time. Taking those relative values into account and translating it into modern day dollars, the offer might have been the equivalent of as much as fifty or even seventy million dollars. That probably says enough about this heralded golden rarity.